Hanglip Mountain Lodge and Kingfisher Lodge $150 per person per night, sharing or single. Come join us on the Cape Town & The Magical Mystery Safari! Three nights is cosmopolitan Cape Town, followed by three nights of wildlife at Entabeni, featuring grassy plains, sandy wetlands and majestic craggy rock formations. Welcome to Cape Town, one of the most gloriously gorgeous cities in the world. Boasting a unique combination of spectacular scenery, vibrant cultures, period architecture and fabulous food and wines ….it is no wonder that Cape Town is considered the most enchanting city in the world! Enjoy the magnificent scenery: majestic mountains, pristine white beaches and lush green countryside. You can take it all in after riding a cable car to the top of famed Table Mountain….then descend for a half day escorted sightseeing tour of the city. Some leisure time allows you to explore further afield – perhaps into the fabled Winelands. Or experience the variety of restaurants, the nightlife or the rich cultural tapestry of the Cape’s townships. For an exciting contract to ‘big city’ life, wing to Johannesburg, meet your private car and driver, and take off into the scenic Waterberg region. With 5 distinct eco-systems, this area is one of the oldest inhabited enclaves on earth. Beneath the feet lie relics from the Stone Age and the escarpment walls still bear intriguing vestiges of San rock art. Entabeni’s upper escarpment offers majestic craggy rock formations and wide open grass plains. The lower escarpment is about 3 degrees warmer and is comprised of sandy wetlands. This invites a wide range of animals to the area and here you will find plentiful wildlife – including the Big Five. In addition to exciting game drives you can enjoy walking safaris, village visits, a sunset lake cruise, spectacular star gazing in the observatory or a helicopter flight to ‘the window at the top of the world’. Welcome to Entabeni Safari Conservancy – a most magical and mysterious land! The experience begins – heading out to the southern tip of Africa. Arrival into Cape Town and transfer to your accommodation at the spectacular Taj Hotel. Centrally located on the St. Georges Mall, which is a vibrant pedestrian precinct with wonderful pavement cafes and bars. The hotel is surrounded by significant historical buildings which include St. Georges Cathedral, the Houses of Parliament, the Castle of Good Hope, the Gardens and many of Cape Town’s National Museums. Depart on an exciting and informative half day Cape Town city tour. Highlights of this tour include a visit (optional) up Table Mountain on the Cable Car, where the varying fauna and flora will be explained, the colorful Malay Quarter, city center and gardens and the historical Castle of Good Hope. The rest of the day is free to explore the attractions of the Cape Town and, just a little further afield, the stunning Winelands. Perhaps you might prefer to do a little shopping at the V & A Waterfront, where both modern and tribal art and artifacts are showcased. A free day to continue exploration of the Cape Town area – perhaps choosing to take a full day tour to the Cape Point Peninsula where you can visit an improbable colony of arctic penguins. Or you may decide to take the ferry to Robben Island where Nelson Mandela was incarcerated for 27 years. This evening, why don’t you treat yourself to dinner at one of the popular restaurants at the Waterfront? Your hotel provides shuttle service to and from the bustling Waterfront area. 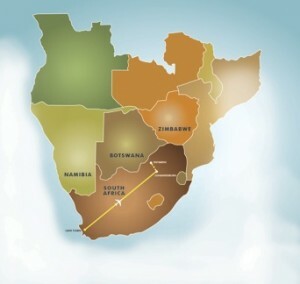 Wing to Johannesburg, then drive north through the scenic rural countryside of the Waterberg. Entabeni is located less than 3 hours away; the sprawling conservancy boasts wonderful scenery, spectacular game viewing and a malaria free environment. The unique features of Entabeni (which means “The Place of the Mountain”) include breathtaking vistas over scenic grasslands, surrounded by mountains, a mile – long lake, a plunging 2000 foot escarpment and – of course – plentiful wildlife that translates into thrilling Big Five game drives, in open 4 x 4 open safari vehicles. Safari participants may choose between these luxury Entabeni Lodges – each of which have their own unique attractions. Lakeside Lodge: Situated on the banks of the beautiful Entabeni Lake, on the upper escarpment. Accommodation includes luxury spacious en-suite bedrooms which are linked by thatched walkways to the Lodge reception, restaurant, conference rooms and boma areas. Outside highlights include: Fig Trees Bush, Entabeni Mountain, Hanglip viewpoint and Hippo Boma. Bush picnics and dinners can be enjoyed in these magical surroundings and private venues. Ravineside Lodge: Located on the upper escarpment under the extending shadow of Entabeni Mountain. The property comprises tranquil thatched wooden lodges on stilts with magnificent vistas. Each lodge unit has 3 or 4 luxury en suite bedrooms with an African ethnic theme. Ravineside’s open grasslands are surrounded by majestic mountains, natural rock formations and verdant bush. There is an abundance of waterfalls, springs, crystal clear mountain pools and streams. “Farewell” to this magical land as you transfer back to Johannesburg airport to board your international departure flight. Welcome Home with memories of the Cape Town & The Magical Mystery Safari! Not knowing what to expect, we were so delightfully surprised when we met our Home Host family. They lived in a darling home near Lion’s Head with spectacular views of the ocean. Our hostess had prepared boboetie – a traditional (and delicious) South Africa dish. Our kids really got on well with the other teens in the family. In fact, we all had a wonderful time. It was our most memorable evening in South Africa!